Other times you will have no choice but to produce feminized seed because it will be a female plants genetics that you want to preserve and you won’t have any males. Perhaps you received these genetics via clone or didn’t keep males. The new thing on the market for commercial Cannabis cultivation are Autoflowering feminized strains. By crossing of the Cannabis ruderalis with Sativa and Indica strains many cultivators have created interesting hybrids which boast benefits from both sides of these families. Although Sensi Seeds already created the Ruderalis Indica and the Ruderalis Skunk crossing, the first variety to be marketed specifically as ‘Autoflowering cannabis seed’ was the Lowryder #1. This ‘hybrid’ was a crossing between a Ruderalis, a William’s Wonder and a Northern Lights #2. This strain was marketed by ‘The Joint Doctor’ and was honestly speaking not very impressive. The genetics of the ruderalis was still highly present which caused for a very low yield and little psychoactive effect. Despite these first disappointing results for the grower and user, the interest of the cannabis community was most definitely caught. After the Lowryder #1 the Lowryder #2 was introduced by ´The Joint Doctor´. 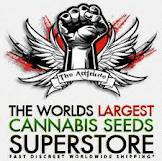 See also the article:”What are autoflowering cannabis seeds” about auto-flowering seeds. A male plant or a plant with male flowers will pollinate your entire crop rendering it seedy. You probably don’t want THAT many seeds so how can you avoid it? Moving the male to another room might work but if that other room shares an air path via ducting or air conditioning then pollen may still find its way. One technique is to construct a male isolation chamber. A male isolation chamber is simply a transparent container such as a large plastic storage tub turned on its side (available at your local megamart). Get a good sized PC fan that can be powered with pretty much any 12v wall adapter, by splicing together the + (yellow or red on fan, usually dotted on power adapter) and the – wires (black on fan, usually dotted power adapter) just twist with the like wire on the other device and then seal up the connection with electric tape. Then take a filtrate filter and cut out squares that fit the back of the pc fan so that the fan pulls (rather than pushes) air through the filter. Tape several layers of filter to the back of the pc fan so all the air goes through the filter. Now cut a large hole in the top of the plastic container and mount the pc fan over top of it so it pulls air out the box. You can use silicon sealant, latex, whatever you’ve got that gives a good tight seal. This can be used as is, or you can cut a small intake in the bottom to improve airflow. Pollen won’t be able to escape the intake as long as the fan is moving but you might put filter paper over the intake to protect against fan failures. You can also use grommets to seal holes and run tubing into the chamber in order to water hydroponically from a reservoir outside the chamber. Otherwise you will need to remove the whole chamber to a safe location in order to water the plant or maintain a reservoir kept inside the chamber. This is the least expensive and most privacy conscious way to produce fem seed. CS has gotten a bad name because there is so much bad information spread around about its production and concentrations. It doesn’t help that there are those who believe in drinking low concentration colloidal silver for good health and there is information mixed in about how to produce that low concentration food grade product. Follow the information here and you will consistently produce effective CS and know how to apply it to get consistent results. Simply construct a generator using a 9-12v power supply (DC output, if it says AC then its no good) that can deliver at least 250ma (most wall wart type power supplies work, batteries are not recommended since their output varies over time). The supply will have a positive and negative lead, attach silver to each lead (contrary to Internet rumors, you aren’t drinking this is cheap 925 silver is more than pure enough) you can expose the leads by clipping off the round plug at the end and splitting the wires, one will be positive and the other negative just like any old battery. Submerge both leads about 2-3 inches apart in a glass of distilled water (roughly 8oz). Let this run for 8-24hrs (until the liquid reads 12-15ppm) and when you return the liquid will be a purple or silver hue and there may be some precipitate on the bottom. To use the silver, spray on a plant or branch three days prior to switching the lights to 12/12 and continue spraying every three days until you see the first male flowers. Repeated applications after the first flowers appear may result in more male flowers and therefore more pollen. As the plant matures it will produce pollen that can be collected and used to pollinate any female flower (including flowers on the same plant). As plant lines are bred to themselves, the plants can lose some of their vitality or vigor. This results from the genetic makeup becoming more homogeneous as siblings are bred to each other or progeny are backcrossed to parents. When two such lines are crossed, they produce a hybrid that will exhibit “hybrid vigor.” Once a desirable hybrid is created, it is possible to take cuttings from it and its clone progeny repeatedly without loss of vigor.It is at this point that you may wish to create feminized seed. These F1 hybrids will be used for planting in gardens, rather than for breeding. With feminized seeds, the grower knows that every plant is female. The seeds are produced using pollen from male flowers which had been induced to grow on female plants. None of the pollen contains male genetics so they grow only into female plants. It is at this point that you may wish to create feminized seed. These F1 hybrids will be used for planting in gardens, rather than for breeding. With feminized seeds, the grower knows that every plant is female. The seeds are produced using pollen from male flowers which had been induced to grow on female plants. None of the pollen contains male genetics so they grow only into female plants. There are a number of other ways to create feminized seed. These include using chemicals such as aspirin and hormones such as gibberellic acid. However, it is easier to breed females to females using chemically-induced or stress-induced male flowers that produce pollen on female plants (forced hermaphrodites). One drawback is that plants that are induced to produce male flowers may have a slightly higher proclivity toward hermaphroditism than the general population. Using them for breeding may be inadvertently selecting for hermaphroditism. So after five or six generations, some of the plants might have more of a tendency towards hermaphroditism. But there is little chance that plants grown from first-generation feminized seed will become hermaphroditic, so they are ideal for using in the garden.